This tutorial builds upon the previous quick win tutorial on “Being Prepared”, so it assumes that the original image has been duplicated, that visualisation layers are in place and that an image map has been prepared. We will therefore move on to the actual re-touching process. 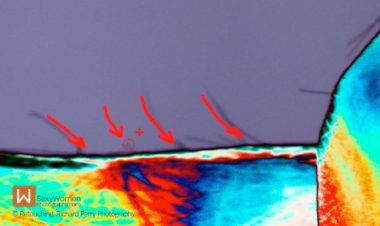 There are several techniques for removing stray (fly-away) hairs from an image. They range from the simple such as the Clone Stamp and Healing Brush tools to the more complex Frequency Separation technique. Each situation is different, so it is worth experimenting with a variety of techniques, to see which works best. Stray hairs protruding out against a plain background are a relatively easy fix. In terms of quick wins, a simple tidy up of these stray hairs works wonders. You can see from the “Image Map for Stray Hairs” that we prepared earlier (see >Being Prepared tutorial) that there are quite a few stray hairs (highlighted in red) that could do with fixing. 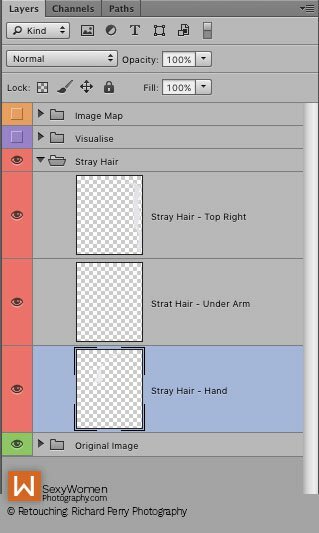 Immediately above the Duplicate Image Layer that was created in the Being Prepared tutorial, create a new blank layer and give it a meaningful name. This will be the layer that you clone pixels onto. This again allows you to work non-destructively as you are not touching the actual image layer beneath and if you make a mistake you can either erase or mask it. You can make as many of these blank working layers as you want. For example you might want to create separate layers for the stray hairs on the background and another for those over the skin, or over the eye, etc. By breaking your work into smaller chunks on separate layers you are again protecting yourself from doing anything stupid like deleting a layer with ALL your work on it by accident. It also allows you to easily alter the properties of different areas of re-touching, e.g. 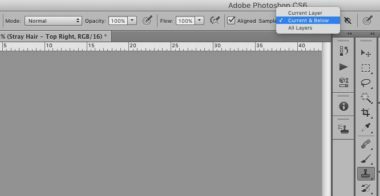 change the transparency of one area rather than for all your retouching. The tool of choice for this part is the Clone Stamp tool <S>. Size = just bigger than the hair strand you are trying to remove. Note: Reducing opacity or using a soft brush may make things a little blurry, so keep hardness set at 100%. You can alter the tool mode to “Darken” or “Lighten” depending on whether the stray hair is lighter or darker than the background that you are trying to remove it from. This can work better than normal mode in some cases, the key is to experiment. Important: the most important step when working with the Clone Stamp tool or Healing Brush on a blank layer is to change the Sample source. When you select either tool and you are working on a blank layer, you will need to set the sample source to <Current & Below>. 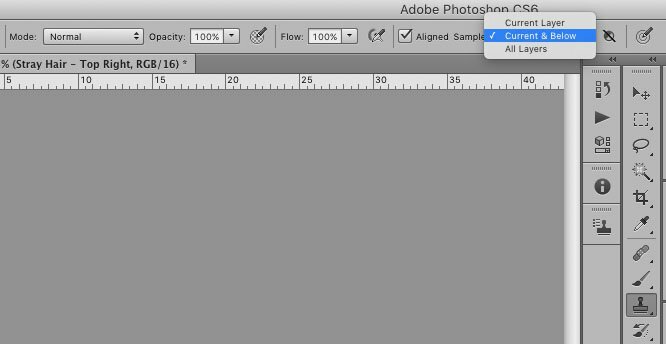 In the main toolbar at the top of the Photoshop window, over to the far right side, there is a drop down menu called, “Sample” (see Figure 1a). When set on “Current Layer”, the brush will sample the current layer only, which is fine if you are sampling and destructively altering the image layer directly. However, we are working non-destructively on a blank above the image layer so sampling the current layer will sample nothing. We therefore need to change the sampling source to “Current & Below”. Now, the Clone and Heal brush will sample the colours and textures from the visible layer below the blank re-touch layer. Now we are ready to start clone stamping those stray hairs into oblivion. Zoom in to around 100% or more to work but remember to zoom in and out quite often to view your work from a distance. You might also find it useful to open a NEW window of the same image but at a different magnification. Having these two views open side-by-side helps to see the overall impact of any changes as well as the close up details (see Figure 1b). Open The Same Document In Two Windows. On certain images you may want to zoom in really close to do some detail work, but at the same time you might need to see how the overall image looks. To solve this problem you can open the same document in two windows and put them side-by-side in two different zoom levels. To do this, (with your document open) go to the top menu bar and select <Window, Arrange, New Window for [file name of your document]>, which will open up a second window for the original document. Then <Window, Arrange, 2-Up Vertical> to place the two windows side-by-side. You can then zoom to different levels on each. Whatever adjustments you make to one window will be reflected on the other. Choose your clone source by placing the cursor over the area you want to clone from, in this case a patch of clean blank background and press <Option/Alt> to select. Make sure you clone from an area that is as close to the area you are re-touching as possible. Then working from the outer tip of the hair, gently brush towards the head, stopping just as you reach the hairline (see Figure 1c). The red circle indicates the brush and the + indicates the sampling point, the red arrows indicate the direction you should be working in. Remember, clone from close to where you are re-touching and sample often. DO NOT be tempted to use a large brush, it is so much better to stay small, the tip of the brush should be just larger than the width of the hair you are removing. Work your way around cloning and removing those stray hairs. This bit might be relatively easy (especially with the solar curve layer on) but it isn’t necessarily “quick”, depending on how many stray hairs you have (remember it is quicker to fix these at the time of shooting). Also, remember you do not have to fix every single stray hair, you actually want to keep a few in place to add a sense of realism to the final image. After you have been clone stamping for a while, TAKE A BREAK and assess the situation. Zoom out. You will probably find that it all looks a little bit too clean cut, with hairs cutting off right at the edge etc. Your next task, if this is the case is to try and make it more realistic looking. Mask the re-touch layer to bring back some of the original image (see Figure 1d). Select the layer you wish to mask then click on the symbol at (1) to create the mask (2), then select the brush tool and set foreground colour to black (4), then bring back some stray hair from the original image by masking the re-touch layer by painting with black over the image but making sure that the layer mask is highlighted (double lines around corners of mask in layer stack). What you paint on the image will be reflected on the layer mask, remember black conceals, white reveals. Some people prefer to use a black layer mask and paint in the re-touching using a white brush on the mask. If this is your preference then hold the <Option/Alt> key when you click the icon at (1) to create a black mask and then set the brush colour to white. 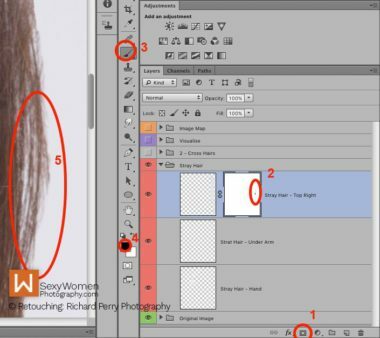 Alternatively, you can smudge the ends of some of the cut-off hair ends using the smudge tool on the re-touch layer to “pull” some of the cut off ends so that they stick out a little from the hairline (see Figure 1e). Clone some of the adjacent hair over the cut off hair tip, or using the clone stamp tool to clone over the cut end so that it stops short of the hair line and not right on the hair line. The objective here is to try and vary the cut off line just a little so that it doesn’t look you put a pudding basin over the head and simply cut a straight line. That’s it for stray hairs. We have eliminated them from the image, Figure 1f shows the layer stack (Red) for this tutorial. And here’s the direct comparison Before<>After. Source File: Download the PSD file for starting your own retouching exercises (140 MB). 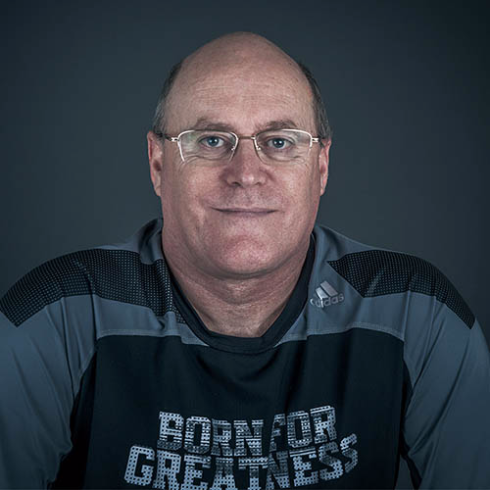 Richard, based in Abu Dhabi, juggles a hectic work schedule with a young family and his passion for photography. An amateur photographer with several decades of experience, Richard enjoys beauty portraiture, although he is most at ease with his first passion of fine art landscape. 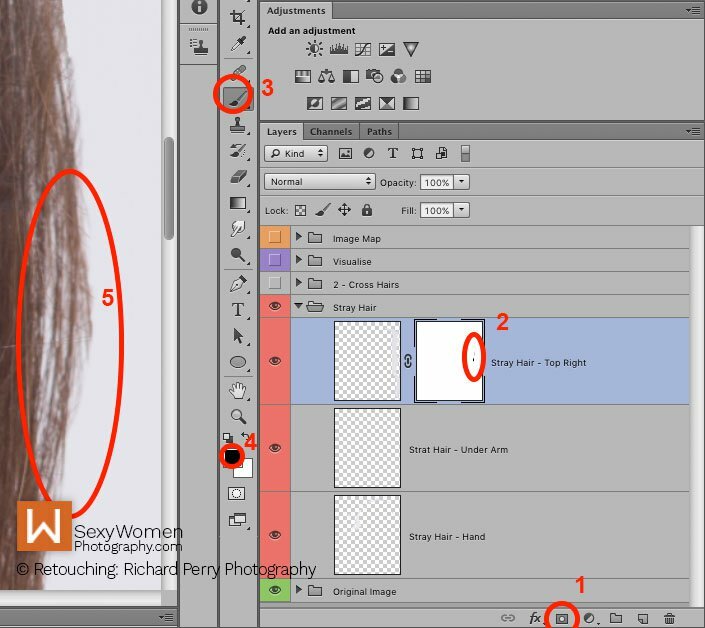 Richard brings Quick Easy Wins in the form of Photoshop tutorials for photo retouching.